Mama B’s been helping strangers through their issues, but her own daughter may have the biggest problem of them all—a problem with Mama B! When Cassandra invites her mother to a “therapy” session, the accusations launched are enough to send Mama B into a tizzy. … Mama B’s got her hands full trying to keep her family together. But Mama B fans know she has her own way of standing up to a spiritual attack, and it sure don’t involve fussin’ and arguin’ with folk. She knows exactly where to turn for help. Why do I like it? Well, for starters, the main character. I wish Mama B lived in our neighborhood. She’s fun, and active, and godly, and eighty years old. She’s also real. She goofs up some, but that’s usually a matter of trying to rush in half-cocked to help someone. Or in this case, to defend herself. Mama B is wise enough to inspire me, but imperfect enough that I can still relate to her. Stimpson’s other characters are always spot on, too. Even the most annoying ones have some reason to act the way they do. I’ve enjoyed every book in this series, so chalk up A Time to Heal as another Great Weekend Read! 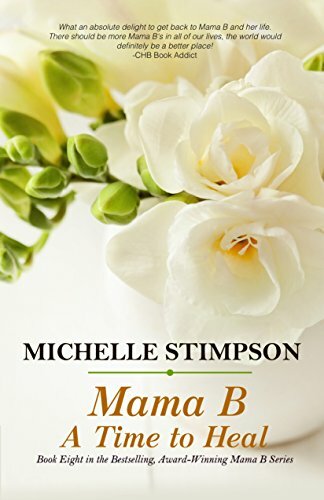 You can visit author Michelle Stimpson’s website by clicking here. This entry was posted in Great Weekend Reads! and tagged African American fiction, Christian fiction, counseling, family counselor, fiction, Janice C Johnson, Michelle Stimpson, novella, therapy. Bookmark the permalink.